This set of four beer and bourbon-infused condiments will bring some extra flavor to your grill spread. Condiment-infused beer and bourbon? No thanks. Beer and bourbon-infused condiments? Yes, yes, a million times yes. 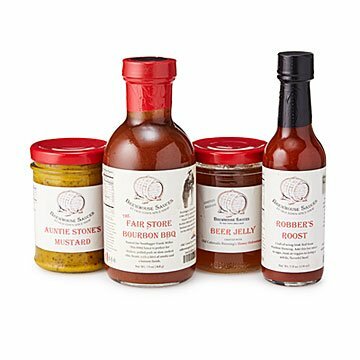 Made in small batches, this set of four will bring some extra flavor to your grill spread: local craft brew is added to the hot sauce, jelly, and mustard, while the bbq sauce is blended with a touch of bourbon. Tofu, eggs, veggies, cheese— every food's a little more fun when it's had a little to drink. Handmade by Sean Godbey and his team in Colorado. Beer Jelly is made in small batches with rotating local beers.